Building Homes for Heroes gifts its 100th home! December 8, 2016 was a milestone day in the history of Building Homes for Heroes -- the nonprofit organization gifted its 100th home to Army Staff Sergeant Sharon Clark in Greensboro, North Carolina. Volunteers and supporters congregated in the afternoon to decorate the home for the holidays, and the house was gifted to Staff Sergeant Clark in a ceremony later in the day. Staff Sergeant Clark heeded her patriotic call in 1995, first enlisting in the U.S. Air Force out of Danville, Virginia. She then joined the Army in 1997 before medically retiring in 2014. She enlisted out of a desire to serve her country, and to forge a better life for herself and her family. An Iraq War veteran and a single mother of two children, Staff Sergeant Clark suffers from an array of physical and mental injuries, including post-traumatic stress disorder and lumbar degenerative disc disease from her years of service. The house was first donated to Building Homes for Heroes by Chase. Building Homes for Heroes then conducted its own renovations to customize the home to accommodate Staff Sergeant Clark’s injuries. In late October, two of Building Homes for Heroes’ biggest donors, Advance Auto Parts and GE Silicone II, helped the nonprofit organization put the finishing touches on landscaping the home during a Volunteer Landscaping Day. 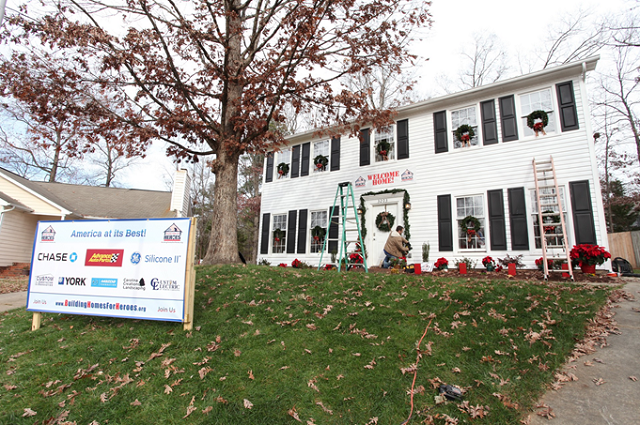 Advance Auto Parts is Building Homes for Heroes’ top cash donor, having donated $6.5 million over five years. GE Silicone II donates 50 cents to Building Homes for Heroes for every tube of GE Silicone sold. York also donated an air conditioning unit to the home. This home gifting is part of an extensive effort by Building Homes for Heroes to gift 11 mortgage-free homes in the months of November and December, to get military families in their homes in time for the holidays.